Since 1996, I have been diligently collecting Lefty Grove baseball cards and memorabilia. Lefty and I were cousins and we both grew up in the same small town of Lonaconing, MD. Please click the link below to go to my Lefty Grove webpage. I also enjoy collecting vintage baseball type cards of neat sets and interesting players. Please click below to see them. Apparently issued over a period of at least two years, based on observed player/team combinations, the 58 cards in this set can be found in either black-and-white or yellow-and-black. The unnumbered, blank-backed cards measure a nominal 3 1/4 inches by 5 1/4 inches, though original cutting variances abound. The cards feature either portraits or posed action photos. The set includes several different types of cards, depending on the caption. Cards can be found with the player's name and team inside a white box in a lower corner; other cards add the position and team in small type in the bottom border; a third type has the player's name in hand lettering near the bottom; and the final type includes the position and team printed in small type along the bottom border. Click the card below to see my 1929-30 R315 set. 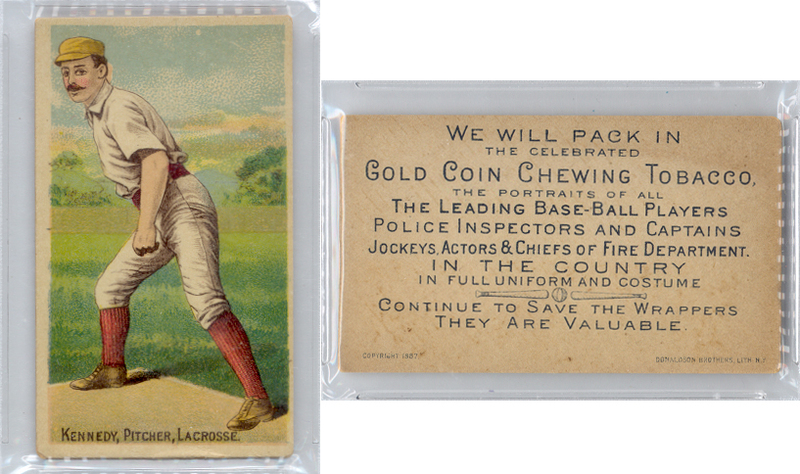 The DeLong Company of Boston was among the first to sell baseball cards with gum, issuing a set of 24 cards in 1933. 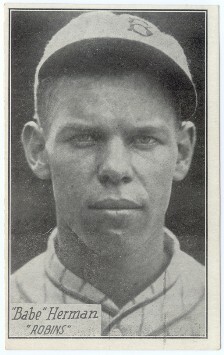 DeLong cards measure about 1 15/16 inches by 2 15/16 inches, with black-and-white player photos on a color background. The photos show the players in various action poses and positions them in the middle of a miniature stadium setting so that they appear to be giants. Most of the cards are vertically designed, but a few are horizontal. Backs were by Austen Lake, editor of the Boston Transcript, and contain tips to help youngsters become better ballpalyers. The ACC designation for this set is R333. Click the card below to see my 1933 DeLong set. George C. Miller and Company of Boston, Massachusetts issued a 32-card set in one-cent packs of toffee in 1933. The set, which received limited distribution, consists of 16 National League and 16 American League players. The cards are color art reproductions of actual photographs and measure 2 3/8 inches by 2 7/8 inches. Two distinct variations can be found for each card in the set. Type 1 cards have the names "Fox" and "Klien" misspelled on the back, while Type 2 cards have them correctly as "Foxx" and "Klein". Collectors were advised on the card backs to collect all 32 cards and return them for prizes. (Ivy Andrews' card was short-printed to avoid giving out too many prizes.) The cancelled cards were returned to the collector with the prize. Two forms of cancellation were used; one involved the complete trimming of the bototm one-quarter of the card, the other a diamond-shaped series of punch holes. The set carries an American Card Catalog designation of R300. 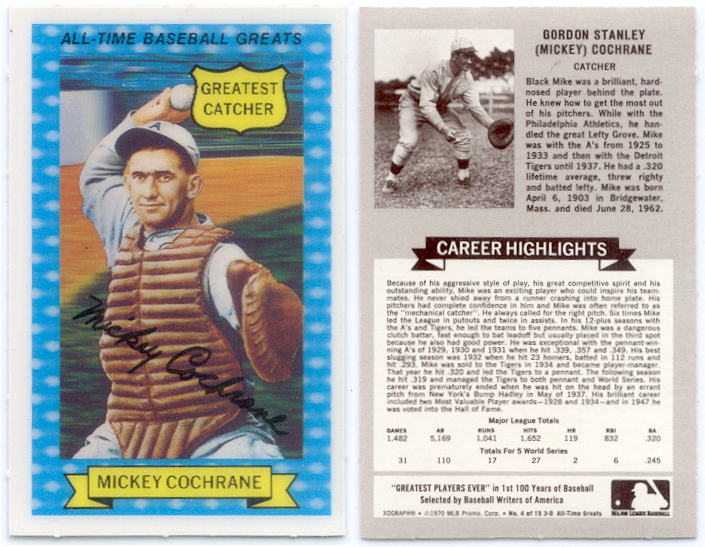 Click the card below to see my set of 1933 George C. Miller cards. 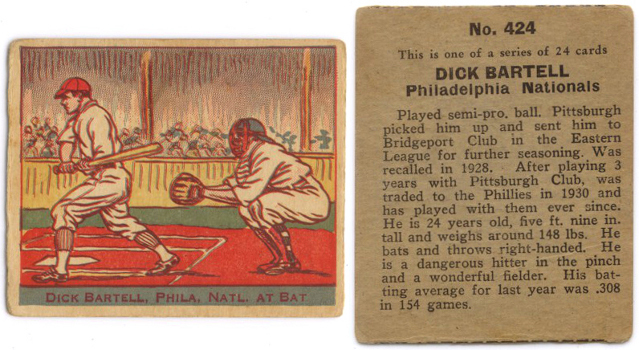 Issued in 1933, this set was sold in eight-card strips. Numbered from 401 through 424, the cards measure 2 7/16 inches by 2 7/8 inches. The design features a crude colored drawing of the player on the front. The back of the card displays the card number at the top followed by the player's name, team and a brief write-up. Card numbers 403, 413 and 414 are missing and probably correspond to the three unnumbered cards in the set. The set carries an American Card Catalog designation of R337. Click the card below to see my set of 1933 Eclipse Imports. 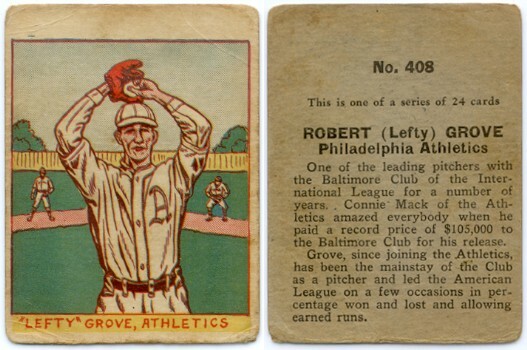 The 1934 Goudey set contains 96 cards (2 3/8 inches by 2 7/8 inches) that feature color art reproductions of player photographs. 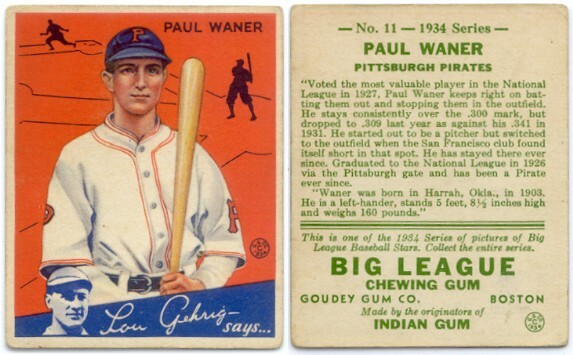 Card fronts have two different designs; one featuring a small portrait photo of Lou Gehrig with the words "Lou Gehrig says..." inside a blue strip at the bottom, while the other design carries a red "Chuck Klein says..." strip and also has the photo. 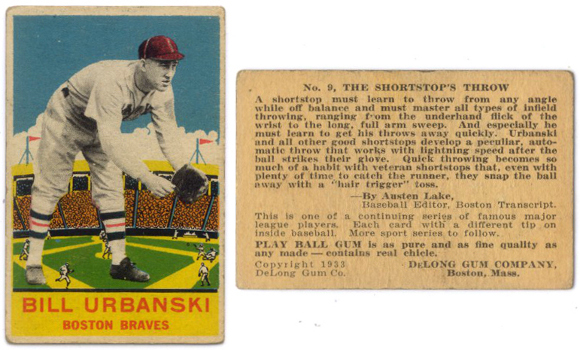 The card backs contain a short player biogrpahy that purports to have been written by Gehrig or Klein. The ACC designation for the set is R320. Albums (blue for National League and magenta for American League) were given away to the person who bought the last penny pack in each box of high numbers or who mailed 50 wrappers to the gum company. 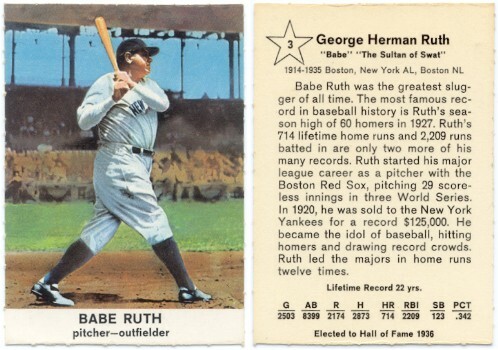 Click the card below to see my set of 1934 Goudey cards. 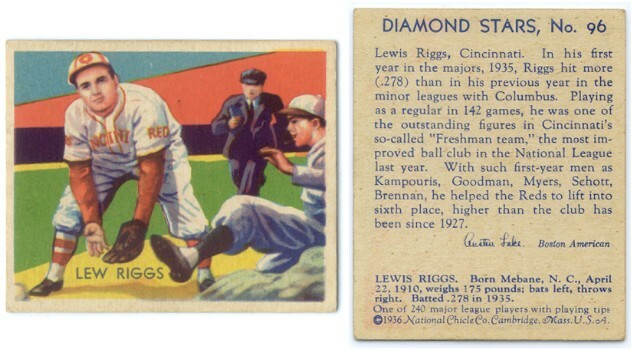 Issued from 1934 to 1936, the Diamond Stars set (ACC designation R327) consists of 108 cards. 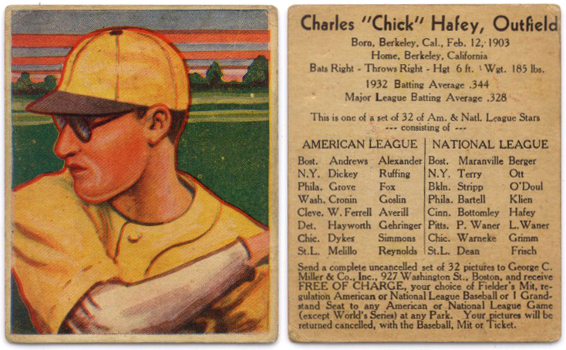 Produced by National Chicle, the cards measure 2 3/8 inches by 2 7/8 inches and are color art renderings of actual photographs on art deco backgrounds. 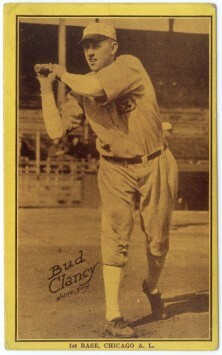 The year of issue can usually be determined by the player's statistics found on the reverse of the card. Backs also feature either a player biography or a playing tip. Some cards can be found with either green or blue printing on the backs. Click the card below to see my Diamond Stars set. The 1961 Golden Press set features 33 players, all enshrined in the Baseball Hall of Fame. The full color cards measure 2 1/2 inches by 3 1/2 inches and came in a booklet with perforations so that they could be easily removed. Please click the link below to see my Golden Press set. The 1970 Rold Gold Pretzels set of 15 cards honors the "Greatest Players Ever" in the first 100 years of baseball as chosen by the Baseball Writers of America. The cards, which measure 2 1/4 inches by 3 1/2 inches in size, feature a simulated 3-D effect. The set was re-released in 1972 by Kellogg's in packages of Danish-Go-Rounds. Rold Gold cards can be differentiated from the Kellogg's cards of 1972 by the 1970 copyright date found on the card reverse. Please click the link below to see my Rold Gold Pretzels set.